We live in a world that contains multiple file types, all of which serve their purpose on devices like the iPhone and iPod touch which are capable of doing so many wonderful things. It is understandable why Apple allows only certain file types to be included when sending and receiving iMessages and text messages, after all, it could get extremely messy if every file type could be used within short messages. Thankfully for us users, iOS developer Dany Lisianksy has decided to take on the challenge of allowing a plethora of different file types to be sent and received from any iOS device through the use of the native messaging system as well as all third-party SMS offerings that are available through the Cydia jailbreak store. I have to admit, in my many years of using iPhones and iPads, I can honestly say I have never really yearned for the ability to add files outside of images and videos, but I can certainly understand why certain people would want the power to share numerous file types via messages. 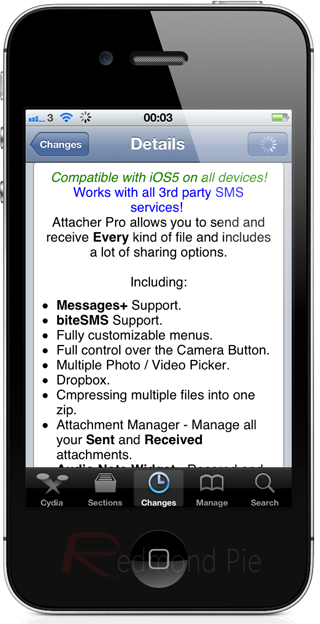 If you fall into this user-base, then the Attacher Pro tweak is definitely something you should be looking at as it offers the ability to send and receive pretty much any file type through iOS’ native Messages app. One of the great things about this package is that it also works with all third-party messaging apps, such as BiteSMS and Messages+. After installation, the immediately noticeable change comes within the compose message screen with the camera button being changed to an Attacher Pro button that invokes the custom menu. Using the tweak is pretty self explanatory, with the action menu containing simple options that allow different files to be added to the body of the text message. Attacher Pro allows the obligatory photos and video to be added as well as choosing from any existing files on the device through the use of a very nice looking file manager, similar to how iFile for iPhone displays directories. Songs, contacts and location information are also included and can easily be added with one touch. The additional ‘Attachment Manager’ also gives a little more power by letting users view and manage all of the files which they have received or sent. 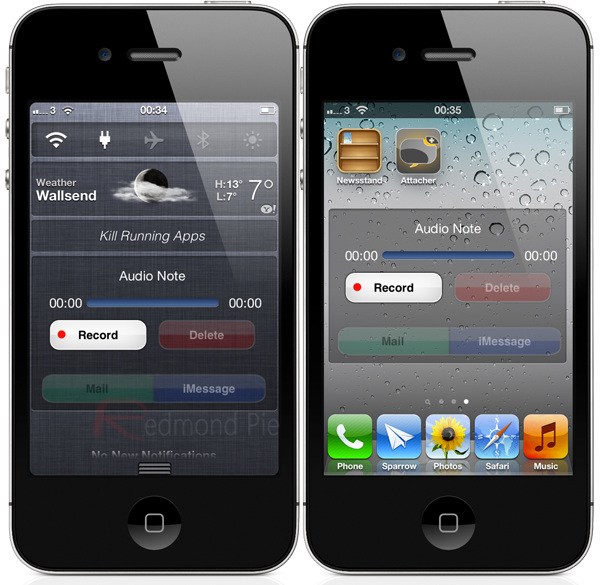 As if all of that functionality wasn’t enough, the developer has also seen fit to include a very handy audio recording widget that is compatible with both Notification Center and Dashboard X which allows audio to be captured and sent quickly via mail or message. 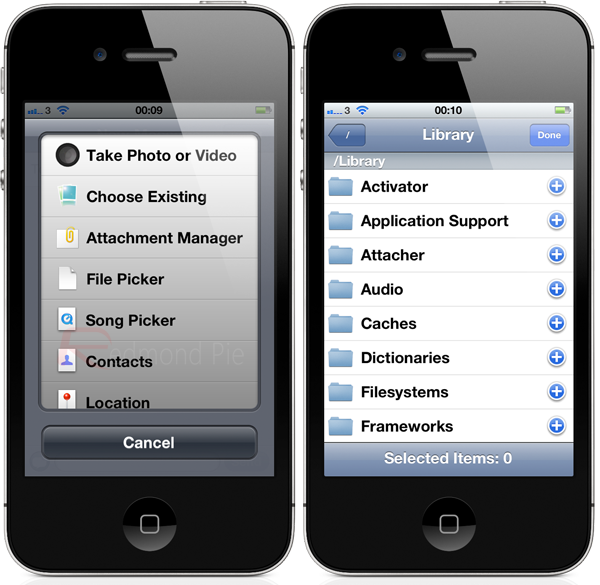 Attacher Pro is available to download for $2.99 from the ModyMyi repository and requires iOS 5 or above.